Discussion in 'The Garage' started by 132zed, Jun 3, 2011. You know sometimes things can seem SO simple that you must be missing something. Things can never be simple. They are always complicated. If you think itâ€™s simple then there is a factor that is missing. And thatâ€™s where I stand. Iâ€™d like to have a suicide clutch and a jockey shifter. 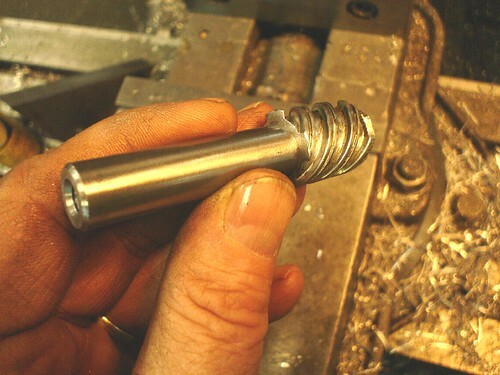 For the jockey shift I was picturing taking the shifter lever, cutting the peg off, turning it vertical (or at 140 degrees..Depends on the angles), drilling holes, attaching a random Â½ inch (diameter) rod I have. Sure Iâ€™d have to bend it a bit to get the angles right butâ€¦that seems to be it. Just throw a die on the top and put whatever you want on it. 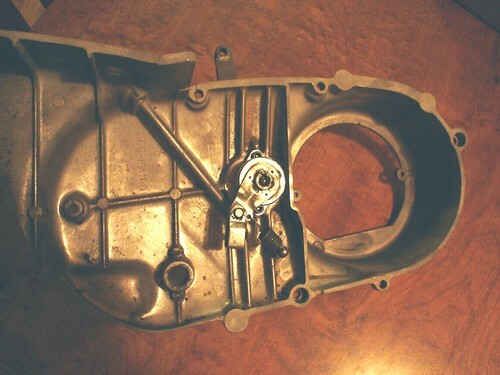 For the suicide clutch I thought about a bracket bolted in the stock control location. Run the cable toward the back of the case and underneath. Run it through the bracket giving you the stability you need to actuate and on to the forward controls. It canâ€™t be that simple. Help me out guys. What am I missing? Is this even possible? There are a few guys with suicide shift on here. Definitely 650Jarrett his Wabi Sabi bike also has one. 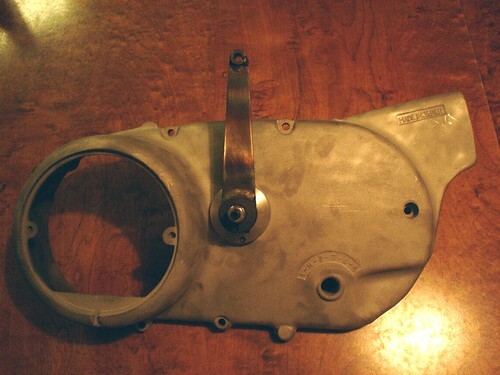 I'll be running a foot clutch jockey/shift set up on my '75. Running a foot clutch using the factory clutch cable is a simple solution, but apparently it's much more susceptible to breakage (Andy at Pangea runs a cable operated foot clutch, as do the fong bros.). The mod grepper mentioned is also is decent albeit a little shanty; Bill Norton perfected the design with a super elegant solution that maintains clutch adjustment and utilizes a machined collar with a bronze bushing to support the shaft. 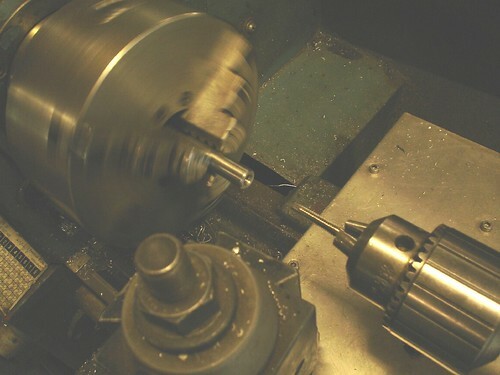 I contacted him, sent him my cover, and he machined a TRICK modified worm gear for me. 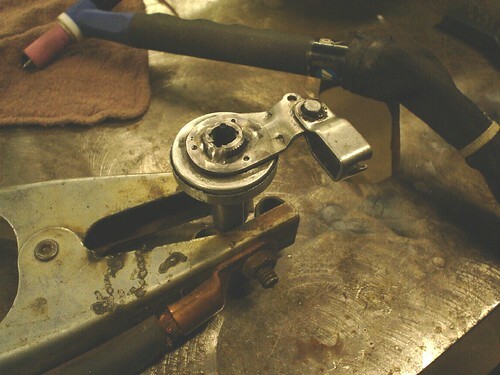 This is the way to go for a no hassle foot clutch; however, in order to keep the lever from slipping, one has to use a double clamp shaft collar. He also keeps the cable catch on the inside of the worm gear should you ever decide to go back to standard clutch. I should be able to get a super accurate adjustment out of this because I don't have any cable slack to account for either. BlackBetty: That looks WAY better than the one on xs650Chopper.com! How much did her charge you for that? I think it looks nicer when its all compact and easy to adjust. When you make outside bracket you got to adjust alot. The one in the cover is just useing the stock stuff. 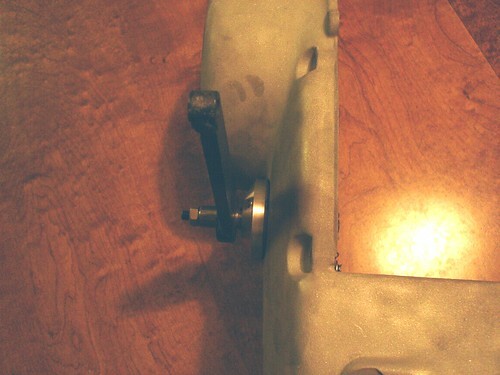 I paid Bill $75 to turn the part plus shipping both ways. Cost me $100 total, but clearly it's the toughest solution. DaddyG, cool solution for guys who don't mind putting an extra hole in the case cover; does that linkage hold up? I found that unless I used high precision heims the linkage will have too much slop. I also found that when using a design like Bill's, heim joints are necessary since the shaft will rotate within the case when the clutch is disengaged, creating a certain degree of misalignment. Linkages holds up have three running around like that and i did try the other way but you have to put a stop in or you push too far and clutch disingauges. You have enough room for Heims in cover if you want to get fancy but throw is so short there is no tork on it. Cheap easy way and clean. Thanks to everyone for their input. And thank you Blackbetty/Daddygcycles for including all the pics and info. Bill's mod is simple and doesn't modify the case cover. It looks like you could easily take that right back to the traditional setup without much work. Blackbetty, how is the functionality? Is it worth paying someone else to do it? Thanks skriblz. 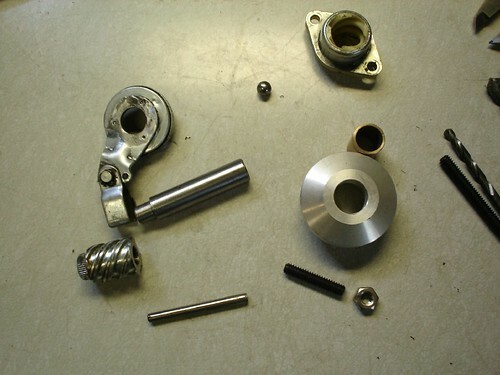 It looks like your set up is pretty much Bill's with the addition of a spring. Why the spring? Was there a problem with it not retuning? Why not just swap the brake and clutch levers. 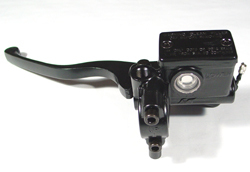 MikesXS has a hydraulic clutch Master Cylinder that can be used as the brake MC on the left side. Easy enough to mount a clutch perch on the right side. Wait. I am think of working the throttle and the clutch with the same hand. Does anyone have any experience with that? Seems...difficult if not impossible. Can't be done. Front brake is rt side.Brake clutch and throttle on one side? Nope cant be done. Azman857, I don't think that is what he meant. He meant clutch on the right and brake on the left. And not everyone's FRONT brake is on the right side. I don't have a front brake so my lever is hooked to my rear brake with no right foot control. Just a lonely peg. If working the throttle and clutch with the same hand is possible I wouldn't mind trying it. I would have no foot controls. Never seen that before. I've seen no hand controls (besides the throttle of course) but never no foot controls. Hmm, no foot controls? Left hand clutch, right hand brake and throttle and a jockey shift could be really interesting. 1. Clutch and throttle on the RIGHT side of the handle bars. 2. Brake on the LEFT side of the handle bars. 3. Rear brake still available with the RIGHT foot when you need to downshift and brake at the same time. How do you adjust the clutch play on that setup?Do you take it apart then do it. I have seen that done on a HARLEY with internal clutch lever . Looks like you foot clutch it BUT you are taking the fun out of falling over on hills when you have both feet up. no foot contrls sound messy, like all over the road messy.